The studio Vudafieri-Saverino Partners has created an enlightened and colorful project for Gymboree Play & Music, the American brand that offers courses with the aim of developing the cognitive and relational abilities of children, starting from the early years, through play activities based on music, art and recreation. To translate the Gymboree philosophy of education into an architectural language, the studio has developed a concept for four schools in China – two in Shenzhen and two in Suzhou – designing spaces that awaken curiosity. The facilities use forms, colors and materials to address the theme of the voyage, with different areas that offer different impressions: the ocean, the forest, the desert, the Arctic, the canyon and space. The intriguing concept finds maximum expression in the kindergarten of Shenzhen Upper Hills, a space of over 2000 square meters containing classrooms and offices. The intriguing concept finds maximum expression in the kindergarten of Shenzhen Upper Hills, a space of over 2000 square meters containing classrooms and offices. 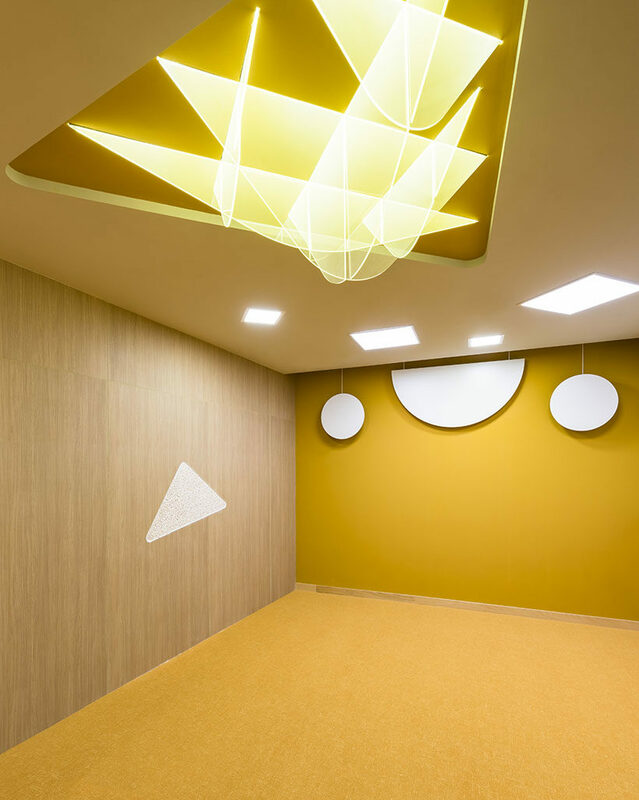 The whole school thus becomes an immersive and experiential space: colors and forms give rise to a world of imagination, in corridors, passageways, the reception area, the cafe, the communal spaces and classrooms. The offices on the upper level are provided with meeting rooms, training areas, a cafe and a kitchen. The interior design is based on simple geometric forms, made with different materials in lively hues.